Learn more about the DML Badge Competition! Let’s go through some of the basics about badges and earn your first badge in the process. But it's often difficult to get recognition for skills and achievements that happen outside of school. Mozilla's Open Badges is working to solve that problem, making it easy for anyone to issue, earn and display badges across the web—through a shared infrastructure that's free and open to all. Now let's see how much you get badges! True or False: Learning today happens everywhere, not just in classrooms. Answer: True. There are countless examples of learning occurring through informal channels. The web and other new learning spaces provide exciting new ways to gain skills and experiences—from online courses, learning networks and mentorship to peer learning, volunteering and after-school programs. True or False: You can understand a person’s skill set simply by looking at their degree. Answer: False. While degrees do convey information about people’s skills, they often tend to be abstracted from the actual learning that has occurred. Two people with the same degree may have taken very different learning pathways or developed different skills. Many people without a formal degree possess a vast set of job-relevant skills. Badges help by providing a more complete picture, recognizing a more granular set of skills. True or False: Resumes are validated and evidence-based. Answer: False. Resumes are documents that people write themselves. Granular information on a resume is often difficult to validate. With digital badges, users can click on a given badge to access information about the badge’s issuer, how the badge was earned, and more. In other words, badges can go beyond traditional resumes by providing built-in evidence for validation. Take the quiz to see if you get badges! Congratulations! 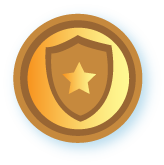 You’ve just earned the Badges 101 badge! If you'd like to send this badge to your backpack, just fill out the form below.